“Have I got a deal for you”. The new overused word on Capitol Hill, this August week in 1975 was Shuttle Diplomacy. And the Man of The Hour for mileage spent hurtling back and forth between warring parties was Secretary of State Henry Kissinger. And this particular week in 1975 was about the never-ending saga of The Middle East. Expectations were high, even though publicly there was no committal, for agreement on a U.S. – sponsored withdrawal of Israeli troops in the Sinai. Having gone through several of these attempts at agreements, talks were purposely low-key and official comments were vague, but speculation and observations were optimistic. Elsewhere on Capitol Hill, President Ford was voicing frustration that the latest rash of CIA investigations was putting a damper on attempts to help the moderates in Portugal. And once again, Henry Kissinger offered tacit support of the moderates by dangling the old Cold-War “Influence from Moscow” warning over Portuguese heads. Ironically, Kissinger had also finished an appearance earlier in the week before the Senate Intelligence Committee hearings on the assassination of Chilean President Salvadore Allende. Naturally, he denied any U.S. role in the coup and assassination. And chances to get former President Nixon to testify over the possible U.S. role in the Chilean overthrow were slim to none. Social Services were under attack again – this time from Treasury Secretary William Simon, who charged the Food Stamp program was a haven for chiselers and rip-off artists. And at the same time, the Social Security Administration admitted to a $403 million overpayment of benefits. Officials cited the error was the result of the takeover of payments by the Federal Government from State Governments, but also admitted that money wouldn’t be recovered. Meanwhile, The White House went to Veil Colorado to play Golf. And that’s what went on in the ever-skewed life of Planet Earth for August 16, 1975 as reported by CBS News and Washington Week. One big happy family – in space, anyway. The good news for this week ending on July 26th in 1975 had more to do with what was going on a few thousand miles outside of Earth, rather than on it. The milestone Apollo-Soyuz Linkup in Space got everybody’s attention that week. The one time in decades the U.S. and the Soviet Union actually worked together and had a good time. 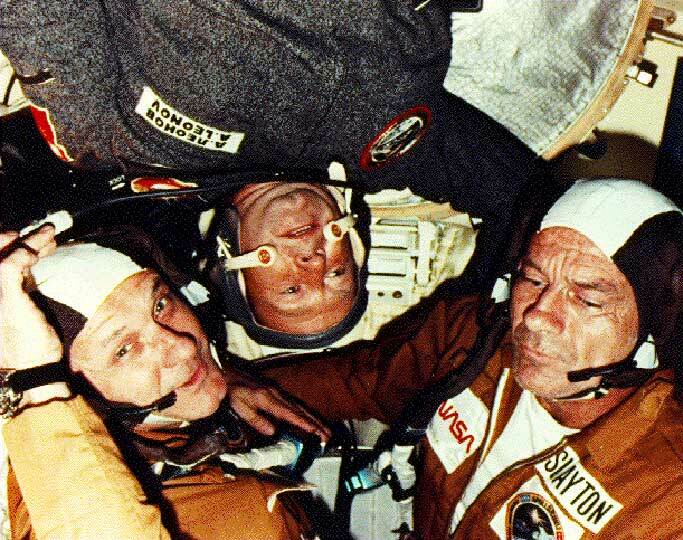 Despite reports of malfunctions in the Soyuz capsule that created a smoke-filled atmosphere the Cosmonauts were almost asphyxiated from, the linkup was a huge success and images of Cold War adversaries were as distant as the capsules were in space. Meanwhile, back on Earth . . . . The much-anticipated Helsinki Summit Conference was about to get underway, with Soviet Chairman Leonid Brezhnev and President Ford scheduled to meet up in the coming days. No one was expecting an air of warm and giddy coming out of Finland as there had in space . . . that would have been too much to ask for. The situation with Turkey was growing unpleasant, as Capitol Hill voted to withhold aid to Ankara and refused to lift the arms embargo. The Turkish Parliament, in retaliation, voted to take command of all but one U.S. base in Turkey. The move worried the Pentagon as it would limit the ability of the U.S. to monitor Soviet activity in the region. Once again, Foreign Policy hits a speed-bump. A reprieve of sorts for the UN Peacekeeping mission in the Sinai as Egypt agreed to a three-month extension of the mission, but held out the prospect of force if the Israelis did not agree to new and acceptable concessions were not made by October 24th. Hopeful was not a word used very much in Tel-Aviv that week, as the Israeli Army was placed on alert. The War of Words continued. And grumblings of Civil War were being heard in the newly independent African nation of Angola as rival faction armies, The Popular Movement and The National Front grouped, re-grouped; captured and re-captured towns. The latest reports had The National Front army was within shouting distance of Luanda, the Capitol of Angola, but Popular Movement forces were well armed and were anticipated to put up a bitter defense. The British and American Consulates promptly closed and sent their officials back to London to sit this dance out. And shakeups were the only property of the Africans this week – in Lisbon Portugal, the military leadership announced the formation of a new leadership triumvirate consisting of the Prime Minister, the President and the Head of the Internal Security Force. How it was going to work and what the outcome of possible free elections wasn’t known at the time. Expectations were rising for more grain sales to The Soviet Union. The U.S. had already committed to 10 million tons, a little over half of what was sold in 1972. But it was enough to raise a few hackles by at least one labor leader who warned Longshoremen wouldn’t load grain shipments to Russia if it meant increased prices in grain in the U.S. So while backs were slapped and hugs exchanged in outer space, all was status quo back down on earth. Same as it ever was. Same as it ever was. And that’s how the week went, the week ending on July 26, 1975 via CBS Radio’s The World This Week. Most people just wanted to get on with their lives. 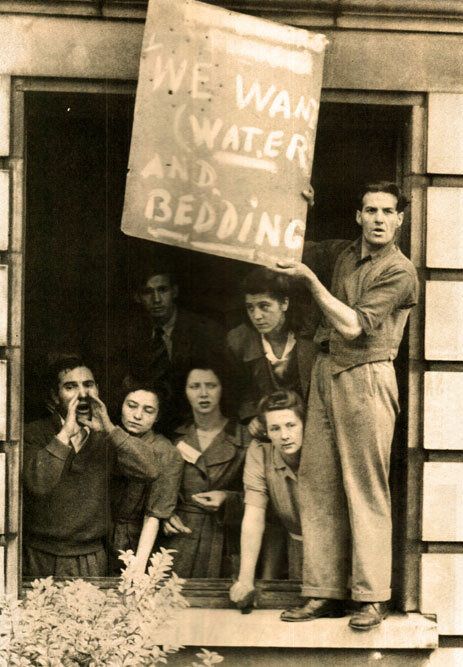 A world in a state of upheaval and change, this week ending on this day in 1949. President Truman spoke those words in reaction to the weariness the world was feeling, a mere four years after the end of World War 2. Recovery was far from over, the scars were only beginning to heal. During this week in July 1949 the Parliament in Britain was in heated debate over what to do about Germany and its reconstruction and Prime Minister Winston Churchill was once again the hot seat. The Cold War was a prominent topic of conversation just about everywhere. President Truman spoke of the growing dissatisfaction over the Soviet Union’s influence in Eastern Europe, saying the trend towards aligning with Moscow was in retreat because those countries were not interested in going from one totalitarian regime to another. And even so, the NATO Pact was alive and well and gathering signatories. Italy, amid threats from Moscow, was anticipated to become part of the alliance – so the battle lines were being drawn, despite protests to the contrary. And the austerity measures, so tightly in the grip for most of Europe were somehow being ignored, at least for a little while on Monaco in the gambling casinos of Monte Carlo, where Craps (or Les Craps) were being introduced for the first time. The need for distractions from the miserable day-to-day were alive and well, if you could afford it. And money problems weren’t the exclusive property of devastated nations overseas. In the U.S. some were pondering the question whether or not we were actually in a Depression. Some said no, but a few disturbing facts were pointed out: In 1949, 27 million Americans had no kitchen sink. 18 Million Americans had no washing machines. 25 Million Americans had no vacuum cleaners and 14 million Americans were without either a bathtub or a shower. Well, Washing Machines in 1949 were still something of a luxury as were vacuum cleaners. But the lack of personal hygiene by way of bathtubs and showers was indeed disturbing. And there was also the question of Race and Communism. Hot on the heels of a recent remark made by Paul Robeson that the majority of African-Americans would not fight a war against the Russians drew, not only criticism but wild-eyed paranoia from some on Capitol Hill. So much so, that Baseball great (soon-to-be-legend) Jackie Robinson was called on to testify before a Subcommittee hearing over whether or not those sentiments were true and universally felt in the Black Community. And the need for distraction from the day-to-day affected the average American too. It was also reported that one of the most popular attractions at local movie theaters was the reissuing of old Slapstick Comedies from the 1920s. Seems there was a strong desire to laugh and forget. Today we call it Reality TV, but in 1949 we called it Laurel And Hardy. Some times, they do change. It’s the sentiments and the issues that rarely do. Fear sadly, never does. And that’s just a portion of what went on this week, via NBC Radio’s Voices And Events for July 24, 1949.